The Best Actress Oscar winner, a delicious French-American dish of sophistication, wit and talent, was born on this day in history. She won her Best Actress Oscar for Frank Capra's IT HAPPENED ONE NIGHT, often called the Granddaddy of Screwball Comedies. Her co-star, Clark Gable, took the Oscar for Best Actor. 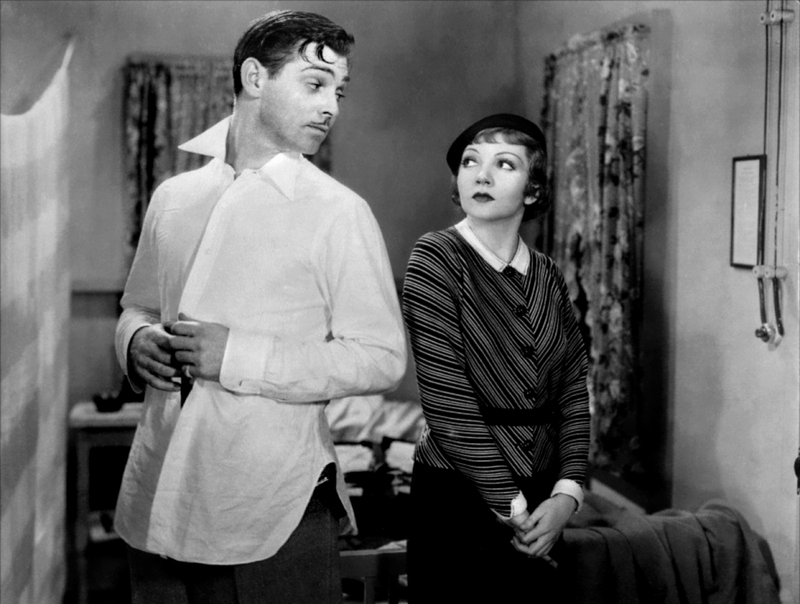 Capra won for Best Director and IT HAPPENED ONE NIGHT took the Oscar for Best Picture of 1934. 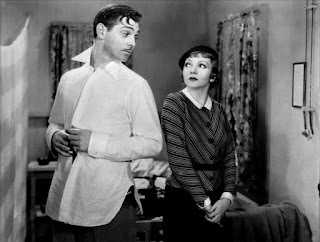 If IT HAPPENED ONE NIGHT is the Granddaddy of Screwball Comedies then Claudette Colbert was the original runaway bride. She'd be followed by future actresses in comedies who also played runaway brides -- actresses from Ginger Rogers to Sally Field and Julia Roberts. That film was made for Columbia Pictures. But from the very early 1930s through the 1940s, Claudette Colbert established herself as one of the most glamorous and flexible film actresses at Paramount. For that studio, she was an art deco CLEOPATRA in De Mille's historical 1934 epic, she was the love interest opposite Broadway's George M. Cohan in his only major studio release as a leading man. Paramount's 1932 comedy, THE PHANTOM PRESIDENT, made decades before Kevin Kline played DAVE, was a comedy about an entertainer who looks exactly like the President of the United States and is called into action to pretend he's the president. Colbert and Fred MacMurray tried to dodge the Salem Witch Hunts in 1937's MAID OF SALEM, she's an intrepid lady newspaper reporter dodging bullets in war-torn Spain with Ray Milland in 1940's ARISE, MY LOVE and she's the American chorus girl/singer stranded and broke in Paris in the fabulous and under-appreciated 1939 comedy gem, MIDNIGHT, a hip twist on the Cinderella tale. She's very good as the military nurse doing her duty overseas right after the attack on Pearl Harbor in 1943's SO PROUDLY WE HAIL, a movie about American women in uniform. I could add several others but I cannot leave out another one of her comedy peaks. It's one of my favorites. 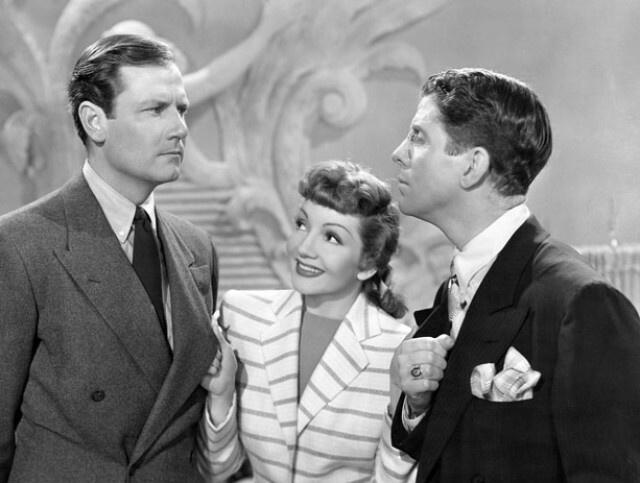 She's terrific with Joel McCrea in the 1942 Preston Sturges classic, THE PALM BEACH STORY. She had more hits and got more good reviews going into the 1950s. Classic film devotees know that Colbert was originally slated to play Margo Channing in Joseph L. Mankiewicz's 1950 classic, ALL ABOUT EVE. She reportedly sprained her back and had to withdraw from the project. Bette Davis, who was in a career lull at the time, was sent the script -- and the rest is film history. Davis worked under contract to Warner Bros. for about 16 years and won two Best Actress Oscars during her time at that studio. 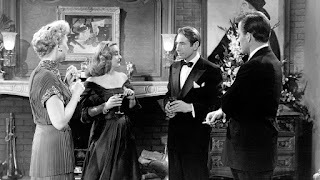 However, when the screen legend died, all the obits on TV news programs began with a clip of Bette Davis in Fox's ALL ABOUT EVE as the Broadway diva ordering her party guests to "Fasten your seatbelts...it's going to be a bumpy night." ALL ABOUT EVE was a 20th Century Fox production. I wanted to write a few quick notes about Claudette Colbert and that film. It broke her heart to lose the Margo Channing role. 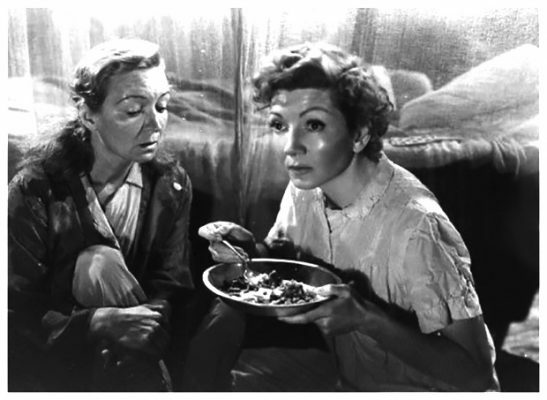 In 1950, moviegoers saw Claudette Colbert in a WW2 drama based on a true life story. THREE CAME HOME was a victory for her. It has one of Colbert's best dramatic outings. It's about female prisoners of war in the Pacific. In styling and attitude and carriage, Claudette Colbert and Bette Davis were vastly different Hollywood stars. In the 1930s, she was Cleopatra. In the 1930s, Bette Davis was Queen Elizabeth. 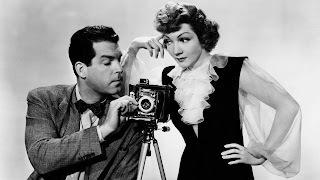 Claudette Colbert was a master at making a beer seem like a champagne cocktail the way she played comedies for Capra, Lubitsch, Capra, Mitchell Leisen and Preston Sturges. 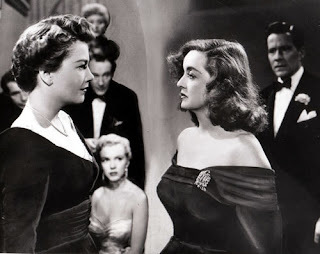 I read articles by Joseph L. Mankiewicz, the man who won Oscars for directing and writing ALL ABOUT EVE, that there would have been "fire and ice" approaches to playing Margo from those two stars. Bette gave us the fire. 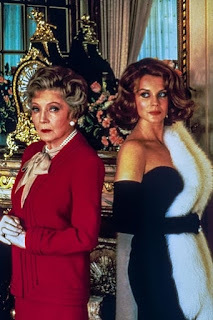 He added that some folks incorrectly assumed Davis based her Margo on Broadway legend Tallulah Bankhead. One of Bankhead's greatest Broadway successes was in THE LITTLE FOXES. Davis did Tallulah's lead role in the film version. Tallulah played Margo Channing in an abbreviated 1952 radio version of ALL ABOUT EVE. Mankiewicz stated that, had Claudette Colbert played Margo, folks would've assumed she was imitating Ilka Chase. 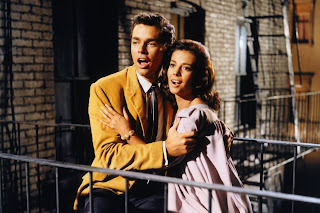 Chase was also a successful Broadway actress. She originated the Sylvia Fowler role on Broadway in THE WOMEN, the role that Rosalind Russell did in the film version and made memorable with own special energy and comedy style. Look at ALL ABOUT EVE again. Anne Baxter, as the duplicitous Eve, is out to replicate her idol, Broadway's great Margo Channing. She weasels her way into her kind idol's life and then sets out to replace her on Broadway and in the bedroom. As the wonderful Thelma Ritter as Margo's friend/housekeeper Birdie warns: ".... she's studying you, like you was a play or a book or a set of blueprints. How you walk, talk, eat, think, sleep." With that said, look at how Anne Baxter is styled compared to how Bette Davis looks as Margo. Does Baxter look like a younger copy of Davis' Margo? 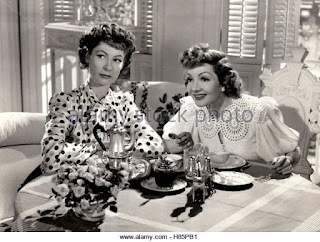 Or does Baxter, in the way she's styled, resemble more a Claudette Colbert type? This is nothing again the performances, it's just a note on the look. Maybe Baxter's look was already set when the crew thought Colbert was in --- then the injury took her out and Davis was a last-minute replacement. A true duplicate of the Bette Davis Margo would've been more of a 1940s Lizabeth Scott or Lauren Bacall, in my opinion. What do you think? Now think about the end of ALL ABOUT EVE with that final shot. Karma will bite Eve Harrington in the backside via an upstart ingenue her calls herself "Phoebe" and cons her way into Eve Harrington's hotel room and her life after Eve becomes Broadway's newest sensation. 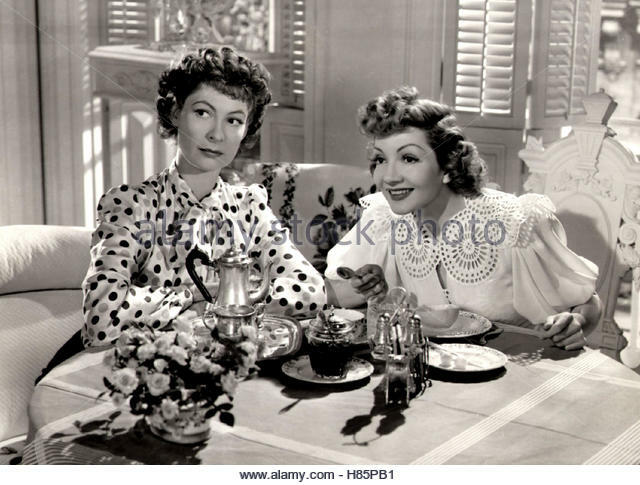 If Claudette Colbert had played Margo, Anne Baxter's look would have been a duplicate and Phoebe's look would have been a triplicate. As for Ilka Chase … both Hollywood stars worked with her. Ilka Chase played the caring, generous cousin to Bette Davis' Charlotte Vale character in NOW, VOYAGER. Ilka Chase and Claudette Colbert played sisters in the Paramount's 1943 romantic comedy NO TIME FOR LOVE co-starring Fred MacMurray. 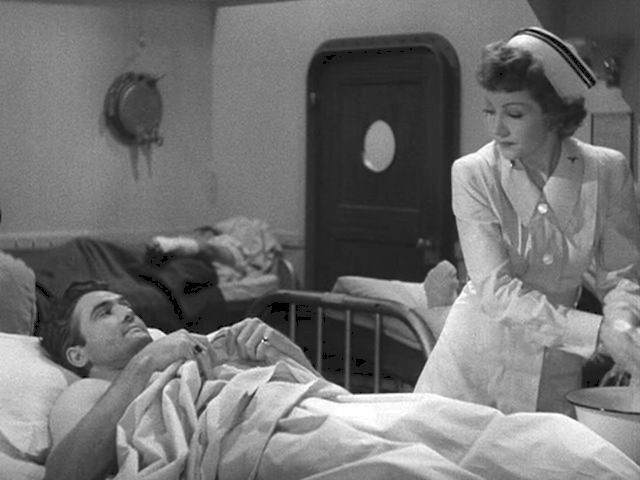 Claudette Colbert's last onscreen hit performance was delivered in a made-for-TV film. She landed the highly coveted role in the 1987 drama, THE TWO MRS. GRENVILLES. Yes, 1987. Based on a Dominick Dunne best-seller, she's the wealthy mother of the chorus girl who married and -- she believes -- murdered her son. Ann-Margret played the detestable daughter-in-law. THE TWO MRS. GRENVILLES is available on Warner Archive DVD. From the Best Actress of 1934 Oscar win to a hit NBC TV mini-series in 1987 that brought her Emmy and Golden Globe nominations. What a long and successful she had. Claudette Colbert died in 1996 at age 92.